Contact ACE Plumbing & Heating to get all the information you need about Carrier heating and cooling systems. Infinity series products represent the pinnacle of our communicating technology. In a heat pump, this advanced system enables some of the best comfort features and energy saving advancements. With the Infinity 19 heat pump you can enjoy two-stage compressor comfort, exceptional cooling and heating efficiency and, when paired appropriately with the Infinity control, greater energy savings and convenient system management features. The 25HCB6 boasts cooling efficiencies of up to 16.5 SEER. Like other Carrier® heat pumps it's designed to be Hybrid Heat® system compatible to help you save on heating costs in winter too. But this Performance 16 model also goes that one step further to give you two-stage compression for added comfort and quiet. The 25HBC3 boasts cooling efficiencies of up to 16 SEER. And, like other Carrier® heat pumps, it's designed to be Hybrid Heat® system compatible to help you save on heating costs in winter too. Comfort series heat pumps are designed simply to be reliable, efficient and affordable. As a heat pump they give you the benefit of summer cooling along with cooler season heating. 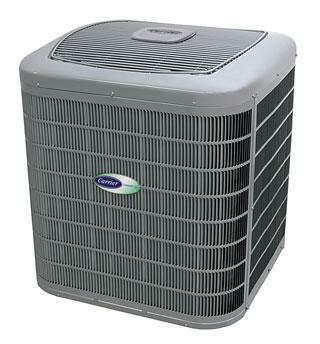 Most Comfort series models are ENERGY STAR® qualified. Be sure to pair this outdoor model with the right, SEER-boosting indoor furnace or air handler to gain the most efficiency.